Settlement includes $125,000 to be spent to improve cycling safety in Philadelphia in the name of Emily Fredricks. PHILADELPHIA (BRAIN) — The family of 24-year-old Emily Fredricks, who died after being struck by a privately owned trash truck as she biked to work last November, has announced a $6.1 million settlement agreement with the truck's owner, Gold Medal Environmental. HELSINKI (BRAIN) — Amer Sports, the owner of Mavic, Enve and other brands, has told its shareholders that Anta Sports Products has made a bid to buy Amer. 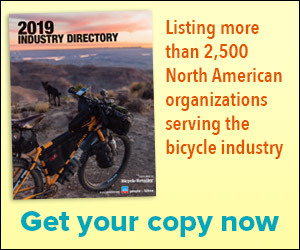 NEWBURY PARK, Calif. (BRAIN) — Dana DeLaRosa, a Giant Bicycles account executive who had worked for the company since August 2007, passed away on Aug, 25 at his home in Housatonic, Massachusetts, after a yearlong battle with pancreatic cancer. He was 58 years old. Orbea hires Parker DeGray as US marketing coordinator. LITTLE ROCK, Ark. — Orbea has hired Parker DeGray to be the brand's U.S. marketing coordinator. BLOOMINGTON, Minn. — QBP has hired Mountain Exposure Agency and Active Agency Sales to expand its service to the Canadian market, effective Sept. 1. ST. JEAN DE MOIRANS, France (BRAIN) — Bill Duehring, the co-founder and president of Felt Inc., has left the company, effective Sept. 7. With more than 25 years of experience in the cycling industry in product development and business management, Grim will lead the LEM team in operations and product innovation and design. MORGAN HILL, Calif. (Sept. 10, 2018) – LEM Helmets, a new, inclusive cycling helmet brand whose mission is to inspire the fun in biking by focusing on safety, style and performance in all its innovative head protection, has named industry veteran Michael Grim general manager. CHICAGO (BRAIN) — With a president who is a former longtime leader of CamelBak, and a bike industry veteran brought on as a new bike-specific sales manager, Osprey Packs isn't shy about its ambitions. Bianchi has significantly increased its dealer support in the Western US /Rocky Mountain regions with the addition of Vince Bynan in Utah, Wyoming and Southeast Idaho, and Brent & McKenzie Winebarger and Tony Iannicito covering Colorado, and New Mexico. Saris's owner said his company has been "abandoned by bicycle trade and industry groups" who sided with importers. COTTONWOOD HEIGHTS, Utah (BRAIN) — When Ali Yazdian began planning his bike rack company about three years ago, he was determined to manufacture in the U.S., as much as possible near his home in the Salt Lake Valley. LONDON (BRAIN) — Rapha has cut 15 jobs at its headquarters in the name of reducing redundancy and costs, the company said. The company said sales were up significantly last year but that it now focusing on long-term profitable growth rather than short-term sales. RANCHO SANTA MARGARITA, Calif. (BRAIN) — Felt Bicycles has rebranded, with a new logo, new corporate colors, and a new website. HELSINKI (BRAIN) — Amer Sports CEO Heikki Takala made clear Thursday that the company is considering selling off both its cycling brands, Mavic and Enve. In the most gentle but firm way, Takala said there might be a better owner out there, somewhere, for the brands, both of which he called "iconic."